The performances of Shakespeare’s Richard III scheduled to take place inside Leicester Cathedral on 19th and 20th July 2017 are causing waves. There can be little doubt that the size and extent of the waves is by design. What theatre company and venue wouldn’t want publicity for a controversy they were causing to appear on the BBC, in the Guardian, the Telegraph, the Times and many other media outlets that would not otherwise have given it a single line of copy? A petition on Change.org has been started to mobilise a campaign to prevent the performance taking place. As I write, it has over 800 signatures and I can see it spread widely across social media. The play is due to be performed at other cathedrals, stopping at Ely, Peterborough, Gloucester, Bristol and Salisbury before a run of fifteen performances at Temple Church, London. The group putting on the play, Antic Disposition, have asserted that it will be staged in a ‘sensitive’ and ‘careful’ way. I’m not averse to this in principle, though I know plenty are and I can see beyond my perspective to appreciate their concerns. Churches and cathedrals have long been centres not only of worship but of community and it is important for their future that they explore new ways to keep themselves at the heart of those communities as society becomes a more secular institution that might question the need for religious ones. My problems with this are really two-fold. Firstly, the staging of this particular play in this particular spot is, at least on the surface, insensitive. I don’t think this is simply because it’s in a religious house ,because it offers an examination of the darker sides of human nature and causes the viewer to consider the conflict between predetermination and free will. There can be few subjects better suited to consideration in church. The real issue is that this play, Shakespeare’s Richard III, is to be performed in close proximity to the king’s new tomb. Given the way his character is demonised in the play, it seems an insensitive and inappropriate move. I have a strong suspicion that the widespread reporting of the play and the outrage it is causing is precisely what was wanted. Ricardians are notoriously easy to get a rise out of and it is this enragement that is being harnessed to produce more publicity than the play would otherwise have ever generated. Antic Disposition claim that their interpretation will be sympathetic and sensitive but without an almost complete rewrite, this seems ambitious at best and disingenuous at worst. I am a firm believer that, and have previously blogged here about the idea that, sections of Shakespeare’s Richard III have been grossly misinterpreted but the subtleties are nuanced, rely on a wider understanding and would be difficult to turn into a focus for the play. My own response to hearing of this was to contact Antic Disposition and ask them whether they would be interested in some copy for their programme, perhaps to explain the differences between the myths and the facts around Richard III and the events of the play. I sent a link to my blog about the play to demonstrate my work and opinion and essentially offered to help if I could. Four days later, I have received no reply, not even a ‘thank you for getting in touch’ or a ‘thanks but no thanks’. Facebook Messenger shows that the message was read on Monday. (UPDATE: 12/05/17 – I have now received a reply from Antic Disposition and am waiting to see whether I can be of any assistance to them. I sincerely hope that I can!) I am also aware that others amongst the Ricardian community had been in touch with the Cathedral and with Antic Disposition directly and quietly to try and express some concerns. The lack of response to any of this and then the sudden eruption of media interest is at least suggestive of a publicity stunt. But, it’s a commercial enterprise, so surely that’s a fair tactic, isn’t it? This is where the Cathedral’s involvement begins to concern me though. Rev’d David Monteith’s response found in many of the articles that ‘What we now know is that he belongs to the whole nation and not just to one section of people particularly committed to his story’ is confrontational rather than helpful. It makes it far easier for view the Cathedral’s interest in Richard III as cynical and financial. The added comment that ‘I’ve heard most people say how glad they are that Richard III, the Shakespeare play, will be performed here’ seems to add to the quarrelsome tone. The Cathedral’s page on Richard III’s background and history begins ‘King Richard III was born at the Castle in Fotheringhay on 2 October 1452, the youngest of three brothers’. Richard was, in fact, the youngest of four brothers – Edward, Edmund, George and Richard. If even this most basic fact is incorrect, it raises concern as to the Cathedral’s commitment to offering even the factual truth about, let alone a re-examination of, their charge. The second element of my annoyance lies with the Ricardian community – of which I consider myself a part (unless I’m ejected after what I have to say!). Sometimes we are our own worst enemies and expose ourselves to ridicule that does nothing to help the cause of promoting the re-examination of Richard’s life and times. I’m sure many would insist that the ridicule is a price worth paying, but it isn’t when it does nothing to forward the cause. If the Cathedral and/or theatre company were relying on harnessing outrage about the performance at Leicester Cathedral to help promote the performance, then the Ricardian community has played right into their hands and given them more than they could ever have hoped for. They went fishing. We fell for it, hook, line and sinker. When Richard III’s remains were discovered, the real opportunity for a re-evaluation of the man and his reputation was lost, engulfed by a tidal wave of bitter arguments about where he should be buried. That fight is still very much alive and I don’t doubt the conviction of those who feel they are standing up for what they believe in, but I would contend that any hope of advancing the real aim of the vast majority of the Ricardian community was hindered hugely by these disputes and still is. Does it really matter where his mortal remains lie? Absolutely not. Does it matter if a play that paints him in a bad light is performed next to his tomb? Absolutely not. Mortal remains are very different to the soul Richard would have hoped would find its way to Heaven. Most medieval kings would object to an awful lot of modern life, not least the irreverence for those holding political power that we take for granted as our right. I find it amazing that there has been no serious documentary on Richard III’s life since he was discovered, given all the publicity around the dig and subsequent events. The only explanation for this gaping omission is that if Ricardians can’t even agree amongst themselves, then what hope can any production company have of producing a documentary that would be widely appreciated and welcomed? It is perhaps telling that English Heritage are, on 23rd and 24th August, showing a rare film of a production of Shakespeare’s Richard III from 1910 within Middleham Castle – Richard III’s long term home. If the performance in the Cathedral is insensitive, then surely the one at Middleham Castle is too. However much outrage we offer in response to however many performances, the play is over 400 years old and isn’t going away. The time has come. I’m going to say it. I’m ready for the fallout. Here goes. Ricardians need to let go of the Shakespeare play. It has been a source of irritation to Ricardians for as long as there have been Ricardians, but I would suggest that it should be harnessed as the biggest weapon in a Ricardian’s locker, not be feared and shunned like a monster chained up in the cellar. Shakespeare’s Richard III is ubiquitous and represents the first, and perhaps only, exposure many will have to this particular king. Some are well aware that it is fiction with political undertones and overtones that have nothing to do with Richard III and everything to do with Elizabethan politics (most notably Robert Cecil, as I have previously blogged). Some, though, will walk away accepting Shakespeare’s history plays – not just this one – as factual, historical documentaries and look no further, leaving Richard III as a murdering, deformed monster. The challenge, and most importantly, the opportunity is to harness this widespread exposure to improve the understanding of the line between demonstrable fact and Shakespearean fiction. It might not be an overnight change, but if Ricardians, perhaps through the medium of the Society, could foster close relationships with theatre groups that meant we supported productions as a method of improving awareness, then the process could get underway. If theatre groups knew they could get a positive reception from Ricardians who would be willing to write copy for their programmes, they would surely do it because it lightens the load on them whilst offering their audiences an interesting and endlessly variable new perspective on Richard to compliment the play and add to their appreciation of it. I would suggest that this approach would be more productive and would bear more fruit than continuing to oppose and rant. This approach, a unifying and moderating of the Ricardian stance, taking opportunities and letting go of those things that cannot, or need not, be changed, is what will lead to increased media interest in a revision of the history surrounding Richard III. This is what could lead to a documentary offering factual information to push gently back against the traditional view. It might even lead to a sympathetic film of Richard III’s life. How amazing would that be? If we keep fighting battles that don’t really matter between ourselves, we will never even take part in the war, never mind have a chance of winning it. Here’s hoping I’m still allowed to call myself a Ricardian! William Shakespeare’s play The Tragedy of Richard the Third is a masterpiece in the depiction of evil and the study of the psychology of the anti-hero, the villain we love to hate to the point that we almost hope they succeed. Yet we may have been deceived by Shakespeare’s play because he may not have meant us to see King Richard III in it. It is beyond doubt that Richard III is replete with errors of all kinds; factual, chronological and even geographical in its efforts to damn King Richard to its audience; and it succeeds. This is the image of King Richard that has imprinted itself onto our collective consciousness; the scheming, evil murderer, worst of all, murderer of children. Yet Shakespeare’s genius in passing fiction into historical fact may have been an accident, or at least an unintended by-product or convenient cover for what he was really asking his audience, and his Queen, to think about. The play was written in the early 1590’s, probably around 1593 and it is important to consider the context in which Shakespeare was writing. The concerns of his contemporaries were great and growing. There was still religious upheaval, with no settlement reached in the country during the sixty years since Henry VIII’s Reformation. Queen Elizabeth I was aging and clearly not going to produce an heir. The question of the succession was growing like a weed, out of control, and no one was tending to it openly, including the Queen. Elizabeth ardently refused to address the issue but it was the proverbial elephant in the kingdom. The religion of the next monarch was a vital matter to the people of England. Transitions from Edward VI to Mary, Protestant to Catholic, and back again to Elizabeth’s Protestantism had been violent cataclysms tearing at the seams of Tudor England and another point of uncertainty was approaching. Shakespeare is widely believed to have been a devout Catholic to the end of his life, forced to hide his faith but doubtless keen to see a Catholic monarch upon the throne after Elizabeth. He was close to his sponsors the Earls of Essex and Southampton who were known Catholics. If we can view Hamlet as a call to arms for English Catholics then Richard III contains similar thinly veiled undercurrents. William Shakespeare appears to have been happy to promote the Earls’ Catholic cause in his writing and skilled at hiding it. So who was Shakespeare aiming his quill at? I believe his audience were meant to see, and at the time would have clearly understood that they were meant to see, Robert Cecil. Robert Cecil was a hunchback. In 1588 Motley’s History of the Netherlands described Cecil as: ‘A slight, crooked, hump-backed young gentleman, dwarfish in stature’ and later spoke of the ‘massive dissimulation (that) … was, in aftertimes, to constitute a portion of his own character’. Motley could almost have been describing Shakespeare’s King Richard III. Robert was the son of William Cecil, Elizabeth I’s lifelong advisor and Lord Privy Seal. In 1590 Robert became Secretary of State and was being groomed by his father to succeed him as the closest advisor to the monarch. After William Cecil died in 1598, Robert succeeded him as Lord Privy Seal but as early as the beginning of that decade, when Shakespeare was writing, the Cecils were operating a covert campaign to see James Stuart, King James VI of Scotland, a Protestant, succeed Elizabeth. Read in this context, the themes and dark threats of Richard III take on a new meaning. King Richard III was perhaps an obvious candidate for the representation of evil. He had lost his life and his throne at the Battle of Bosworth to Elizabeth’s grandfather, King Henry VII. On 22nd August 1485 the monumental Plantagenet dynasty had crumbled and the Tudor rose had flourished in the remains. Henry VII had married Richard III’s niece, Elizabeth of York. As a daughter of King Edward IV, slandering this portion of the Yorkist Plantagenet family was thoroughly out of bounds – Elizabeth of York was Elizabeth I’s grandmother. Richard III sat alone between Edward IV and Henry VII with none to defend him. Henry had made great play of rescuing the country from Richard so he was an obvious villain for a Tudor writer. The first thing to consider is the physical representation of King Richard. 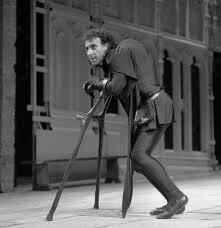 Shakespeare shows us a hunchback with a withered arm. Whilst stories of King Richard having uneven shoulders existed and Sir Thomas More had used the word ‘crookback’ in his Historie of King Richard III, Shakespeare may have exaggerated these into the limping hunchback of his play, but Robert Cecil was, in fact, a hunchback. The withered arm seems to be a fabrication, perhaps a hint that it was not really Richard. I imagine the gasps when he walked out on stage for the first time and people nudged each other with knowing looks, whispering “It’s Robert Cecil!” furtively, the knowledge spreading like fire through the crowd. The warnings of Richard III were plain to see. Richard had upturned the natural order, murdering his brother amongst others until he stole the Crown from his nephew, slaughtering the two young Princes in the Tower and poisoning his own wife. This upsetting of the correct way of the world had seen Richard king for a while but had ended in disaster, with him betrayed and killed at Bosworth and his dynasty blown to the wind. Ultimately, Richard was the architect of his own demise and I believe that Shakespeare was offering a warning that Robert Cecil was to become the architect of the downfall of the Tudors. Richard is an appealing villain – he is funny and clever. We are forced to examine our attitude to the blatant evil played out before us. We almost like him, and we are supposed to. Elizabeth I liked Robert Cecil, a man she called her ‘little imp’ and Shakespeare was warning that this veil of amiability hid dark schemes that would doom the Crown. Namely, Cecil’s plot to see the Scottish Protestant James Stuart as King of England. Richard is the archetypal anti-hero. In his opening soliloquy he tells us all what he is planning to do, that he is ‘determined to prove a villain’, drawing us in so that we feel like we are his co-conspirators, accessories to what follows since none of us leap up to stop him. Complacency in the face of such deeds will bring ill upon the kingdom, as will allowing Cecil the room to plot a Stuart succession. Another key theme of the play is the balance of free will against fatalism. Richard appears to be the master of his own destiny, to be driving events, giving us a Machiavellian lesson in power politics. To balance this, Richard also appears to act as though God intends the outcomes of his actions, to try and use religion to circumvent the unpleasant nature of his actions. His professed free will is an illusion. So religion becomes a central theme, man’s desire for free will against God’s plan. Cecil’s desire for a Protestant succession versus a return to the ‘correct’ religion, Catholicism. Robert Cecil is acting contrary to God’s will to try and get what he wants. As Elizabeth I grew older and had no heir, the issue of the succession was a rising concern to the whole country. The last time that there had been a serious issue with the succession was following the death of Elizabeth’s brother Edward VI, but this was possibly a little too close for comfort. Before that, the seizure of the throne by Richard III from his nephew Edward V had thrown the country into political convulsions. Edward IV had died leaving his twelve year old son in the care of his uncle Richard. On the basis of illegitimacy, Richard had taken the throne from his nephew. This had led to civil war and, in Tudor mythology, to the need for a saviour to right the wrongs. Shakespeare was warning Elizabeth that she risked plunging the country into darkness that would lead to a violent restitution. Her duty was to ensure a smooth transition. She was failing to do this and it was the country that would pay. 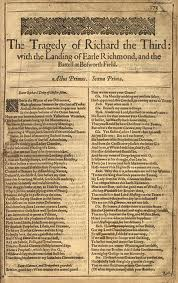 Read in this context, the context in which Shakespeare’s audience would have watched it, the play becomes a moral warning to Queen Elizabeth about the effects of the uncertain succession and of allowing Robert Cecil to follow his own course. Shakespeare and his Catholic sponsors were keen to see a Catholic monarch return England to the true religion. They certainly did not want Cecil, to whom the Earl of Essex was openly opposed at court, orchestrating the Protestant succession of a Scottish monarch. The Earls of Essex and Southampton later rebelled, trying to capture the Queen in order to force their demands upon her. Essex was executed after their failure. Southampton was condemned to death but his sentence was commuted to life imprisonment. Elizabeth never named an heir. Cecil got his Stuart succession and served James I, being elevated as Earl of Salisbury. Shakespeare became a legend. Richard III became a villain. Perhaps by accident.